Storage is not just a big dumping ground, it comes with its own infrastructure and being able to manage the movement of content throughout that can be crucial. 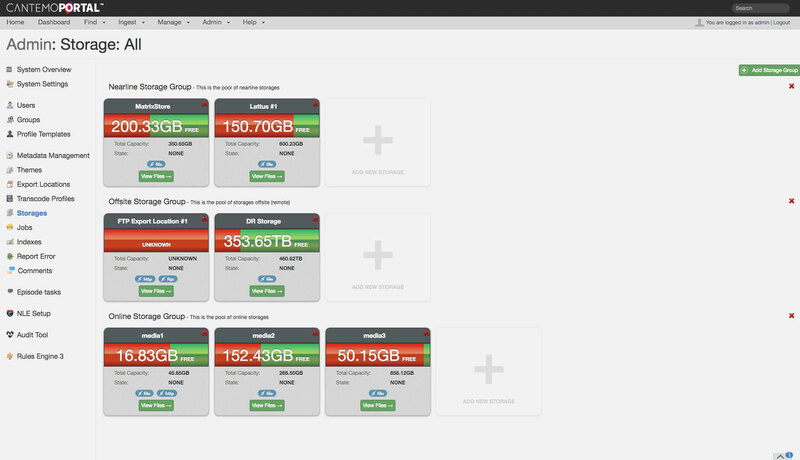 Cantemo Portal™ allows you to manage the movement of content from any tier of storage. This means that you can define exactly where within the storage your assets should be stored. It also means you can move items around within the storage directly from within Portal, either manually or automatically based on rules in Rules Engine. The Cantemo Portal platform is Linux based so as long as your storage infrastructure can be mounted on a Linux environment, including StorNext/XSAN/NFS/SMB/CIFS/AFP mounted storages, it will be compatible with Portal. The performance might differ based on the method used for mounting, and in some cases it might also limit. We highly recommend to collaborate with our certified partners to confirm which method is suitable for your setup. No matter what hardware setup you have, it will be compatible with Cantemo Portal. It can be installed on your existing infrastructure and support virtual machine installations. We support a list of different storage types, including local and remote storages. We also support different storage communication methods, including the standard Linux file method for mounted storages, FTP/SFTP for remote storages, S3 for AWS S3 buckets, HTTP, and finally OMMS for MatrixStore, the nearline solution from Object Matrix.